There are many folks who want to make popcorn in the microwave but don't want all the chemicals and additives found on the microwave popcorn bag. Some may use the Homemade Microwave Popcorn method, while others will purchase a commercially available microwave popcorn popper. The microwave popcorn popper is usually made of a microwave safe plastic in the shape of a bowl. In most poppers you can use oil or chose not to. The microwaves heat up the moisture in the popcorn kernels turning it to steam. When the pressure builds to a critical level the kernel explodes into a flake. There are two microwave popcorn poppers that deserve consideration in the selection process. The most popular, with the most unique design, is the Presto 04830 PowerPop Microwave Popper . You can find a detailed description of this popper on the Presto PowerPop page. The second alternative is also a user favorite and the least expensive of all poppers, regardless of type. 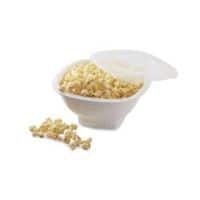 The Nordic Ware 60120 Microwaver Popcorn Popper is simply a microwave and dishwasher safe bowl with a lid that can be used to pop popcorn as well as other uses. The Microwaver can be used with or without oil. It makes a maximum of 3 quarts of popcorn. And you can eat right out of the bowl. It couldn't be any easier to make popcorn and cleanup than with this popper! Believe it or not this popper is actually manufactured in the good old US of A. Perhaps the most popular feature of the microwave popcorn popper that it uses microwaves rather than oil to pop the corn. This makes the popcorn produced more healthy and lower calorie than popcorn made with oil. Similar to air-popped popcorn, a cup of microwave popcorn has only thirty calories, which is about half of what oil-popped popcorn has. Of course if you add butter or caramel after it's popped you quickly diminish the health advantage. The fact that popcorn from a microwave popcorn popper has no oil on it can be advantageous if you plan to add some flavoring to the popcorn. You don't need to be concerned with how the flavor of the oil on the popcorn will interact with the flavoring you are going to add. Unlike the air popcorn popper, with a microwave popcorn popper you have the option to use oil if you prefer. This way you can add flavor to the popped corn. Popping with oil will allow the salt to stick to the popcorn much better as well. A microwave popcorn popper is very efficient when it comes to making popcorn. Normally there are very few "old maids" (unpopped kernels) left in the bowl. Although nearly any microwave oven will pop corn it appears that it is advantageous to have a microwave oven with power greater than 1,000 watts. These will pop the corn more rapidly resulting in slightly better tasting popcorn with fewer unpopped kernels. The greatest challenge with using a microwave popcorn popper is adjusting the length of cooking time correctly. If the microwave oven is stopped too early there will be more old maids. If it is allowed to cook too long some of the popped corn will be scorched. Since all microwave ovens are different the popper manufacturer cannot specify how long to cook the kernels. The best way to adjust the cooking time is by listening to the kernels popping. After putting the popper in the microwave oven you set the cook time to about 5 minutes, use the highest power setting, and hit start. In a few minutes the popcorn will begin to pop. Allow the popping to continue until the time between pops slows to about 2-3 seconds. At that point turn off the microwave oven. Remove the popper from the microwave oven taking appropriate precautions since the popper will be hot. Carefully lift the cover toward you to keep any steam away from you. If the popcorn is kept dry, no oil used during popping or flavoring added after popping, the setup and cleanup of the microwave popcorn popper is very simple. The bowl can just be wiped down with a damp cloth. If oil is used during popping or flavoring added after popping the bowl can be hand washed with soapy water or put in the dishwasher. Be sure to read the instructions with your microwave popcorn popper to verify that it's dishwasher safe. The microwave popcorn popper makes popcorn very quickly. It typically makes 3 quarts of great popcorn in about 2-3 minutes, depending on the power of the microwave oven. Microwave popcorn poppers are designed to be small enough to fit in nearly all microwave ovens. This has both advantages and disadvantages. If you have a small microwave oven read the dimensions of the popper be sure that the popper will fit. It's important that if your microwave oven has a tray or carousel that the popper can be used with those in place. Removing them could cause the popper or the microwave oven to malfunction. Unfortunately, I believe the small size of the microwave popcorn popper is also its greatest drawback. Because of its small size the microwave popcorn popper is limited in how much popcorn it makes at one time. The microwave popper makes a maximum of 3 quarts of popcorn in one batch. In contrast most stovetop poppers make about twice as much and air poppers around 4.5 quarts. Three quarts is enough for a typical snack-size bowl or two small bowls for light eaters. Often my wife and I will make popcorn for dinner if we plan to watch a movie. We both like at least 4 quarts in this case - similar to a large tub you would get in a theater. That would require three batches using a microwave popcorn popper. If you need to make more than one batch the efficiency of most microwave ovens go down as they heat up so successive batches may take longer and have more unpopped kernels. It may be best to let the oven cool down a little between batches if this happens.